America has a culture of appropriation, but given enough time some artifacts have earned their distinction as truly American: the hot dog (doch kein Wurst), baseball (crickets are bugs, no? ), and the jean jacket (no analogue I can find). Having just finished a piping slice of traditional southern chess pie from Adaora’s creative oven that was so authentic I felt like an extra in a Tennessee Williams production, I found myself requesting a cultural continuance. I wanted coffee, greasy food, and above all, I wanted to patrol the dusty corners of a used bookstore. An hour later we plunged through the crowds on East 14th Street like residential flotsam on a river of Manhattanites, professionals and itinerants alike. Dodging fighting children and fearless pedestrians emboldened by cell phones we followed our stomachs to the second best pizzeria in New York. Joe’s Pizza, like frontrunner Bleeker Street Pizza, has more photos of off-guard celebrity visitors, celebratory newspaper clippings and triumphant stickers from vaunted travel agencies than an oil rig has barnacles; yet compared to its cousin, Joe’s invests marginally more in its identity as “restaurant,” and sports a unified red and white painted interior with seats and tables aplenty. The slices were stellar, flavorful and fell apart like only a New York City pizza can. Stomachs purring, eyes alight, and determined to dive deeper into the East Village to avoid its northern edge, we left in search of the land of a million books. Strand Bookstore houses a purported 30 miles of books on its shelves, and I believe it. Four stories of brightly lit, labyrinthine expanse holds tomes from Shelley to Sherbet. If a vaguely thematic collection of books on a table can be called an island, Adaora found herself lost in a veritable archipelago of contemporary titles. Though on the same floor, I felt several horizons distant tucked into a vertiginous and dimly lit assemblage of shelves so packed and sinuous I could have been a turnip in a literary small intestine. Overwhelmed and squealing silently with excitement, I surveyed the largest science fiction novel collection I have ever seen in one place while I listened to tut-tutting bookkeepers discussing the military etymology of the word decimate (paring one in ten to restore discipline) and how it applied to their shelves. Resorting to attendant carts of used copies I found a childhood favorite and proceeded to talk Adaora into buying two new books. We left singing and satisfied. Our third and final stop was the Grey Dog, a distinctly American take on a distinctly American phenomenon- the coffeeshop café. Outside the US, only in the UK does the word entail ordering coffee and reading, studying, chatting and otherwise occupying tables for an extended time. Grey Dog, drawing from the ethos of the Black Sheep, Lone Wolf and Iron Horse in Western Mass, served comfort food, beer and wine, and felt like a rustic safe haven for coffee enthusiasts and Village cosmopolitans alike. Wooden walls, 1950’s era tables with state-by-state maps and the words PBR buzzing quietly in neon in a corner were all pulled together by an unlikely linchpin: a hutch center-right, once painted green with all manner of silverware, condiments and condiment substitutes, framed by yellow hanging ceiling lights. Grey Dog occupies the sweet spot between a dive and manufactured rusticity. 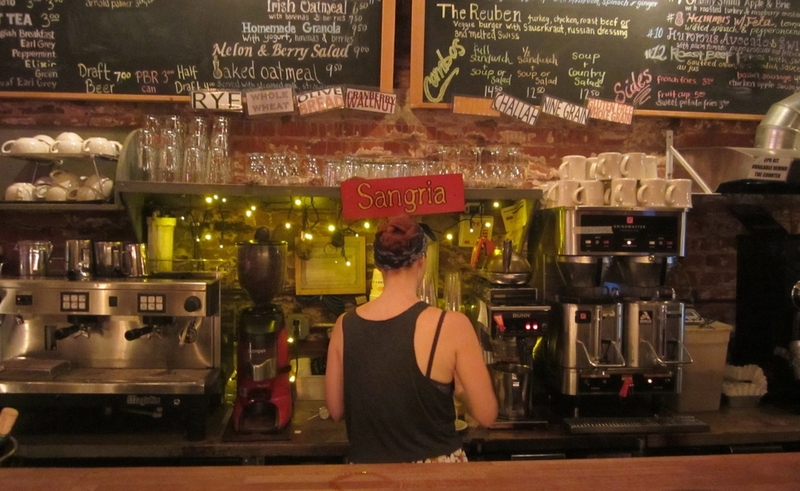 It sports the indelible authenticity of a true East Village establishment. Over coffee, an 8” brownie cheesecake slice, with books new and old, we smiled. A peaceful subway ride across the Upper West side and one churning elevator ride later we plopped down on the couch and celebrated an American cultural success.